REVOLUTIONARY! 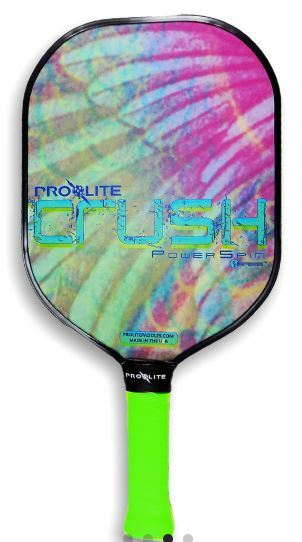 The CRUSH PowerSpin is ProLite’s newest paddle release built on the Company’s most successful paddle shape – the Magnum. But this one’s not graphite like the Magnum – and it has some attitude. 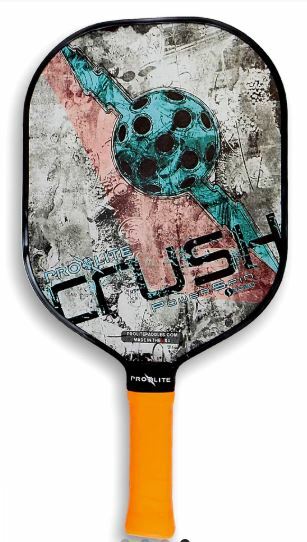 The interior of the CRUSH is constructed of QuadCore™ polymer honeycomb, sandwiched between two sheets of ProLite’s new, durable, SPINtac™ fiberglass panels. What does this mean to the average player? 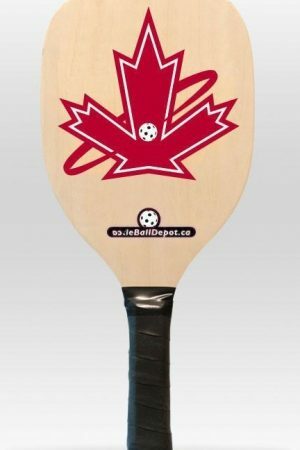 A quiet paddle built for spin, with an oversized face, plenty of control and tons of CRUSHing power. 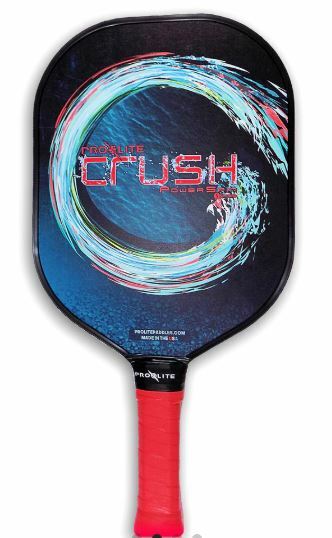 The CRUSH PowerSpin™ paddles not only look great, they’re performance masters. 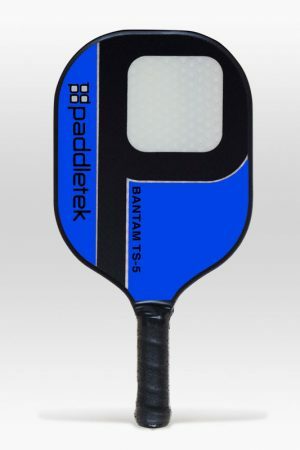 Utilizing the very best in QuadCore™ polymer honeycomb cell technology, these paddles will stand up to any challenge on the court – any ball type and any opponent. Light head weight means faster responses. 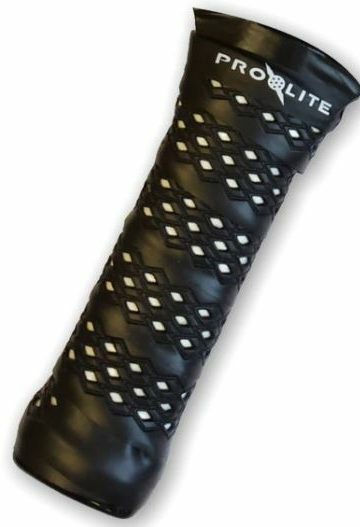 Smaller grip size adds control on those inside-out net shots. Baseline drives and power packed volleys are givens. 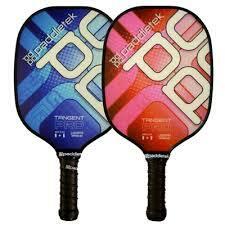 And its SPINtac™ surface is designed for ultimate spin control at the moment you call on it. The exclusive ProLite MicroEdge™guard is unobtrusive yet it adds to the overall balance, resulting in finesse shots as needed, and an abundance of power when the time is right. 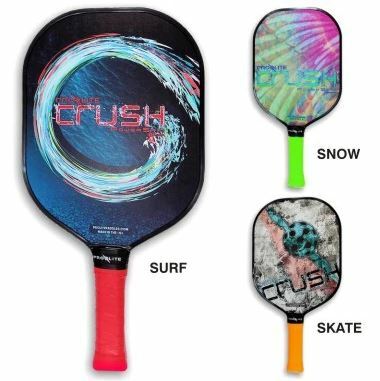 Made in three different graphic styles named Surf, Skate and Snow – each is uniquely designed to appeal to pickleball athletes who play hard and deserve to stand out. NOT DESIGNED FOR WALLFLOWERS. CRUSH Surf emulates an ocean wave curl in deep, dark blue water. Contrasted with splash tones in a variety of blues and muted bubbles rising from the paddle handle. Hot coral color highlights the paddle name. Comes with a bright red No-Slip Thin Grip. 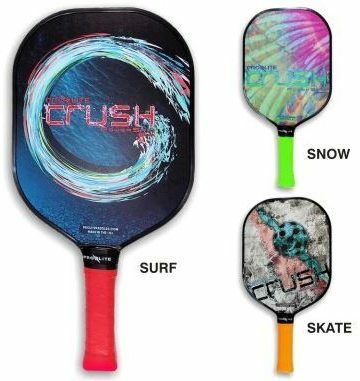 CRUSH Skate is a little rad with a turquoise grunge version of the ProLite ball and bolt. The design is contrasted with a coral colored geometric shape on a gritty looking skate park background in dark gray tones. Comes with a tangerine No-Slip Thin Grip. CRUSH Snow is truly unique. It features an antiqued, holographic look of an eagle wing fading from brilliant pinks to translucent greens and blues. 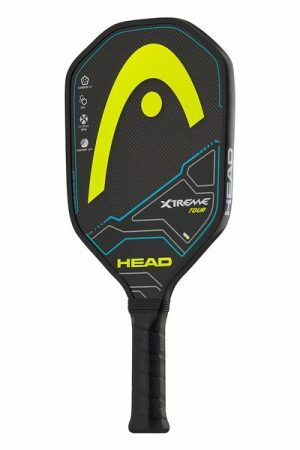 The paddle name is highlighted as part of the design in a neon turquoise. Comes with a lime green No-Slip Thin Grip.